With the increase costs of infrastructure and industry etc why cant you get more of a country's collected resources when you capture its capital. Even if it is a percentage of all resources, but to get only money when the country has 20000 oil and 35000 metal and you only get money is very harsh. I can understand not getting gold and manpower and accept that, but we should get a percentage of the resources collected my a country when we capture that countries capital. Even if it is only 75% of all resources excluding both manpower and gold, but all others should be a given. The post was edited 1 time, last by BattleIvan ( Jan 3rd 2019, 9:31pm ). You do get a portion of the production from each province that you capture when you capture it. For example if you capture an oil province that makes 3,000 barrels of oil a day, you will likely get around 1500 barrels of oil. I don't recall if it is a random percentage, or if it is capped to 12 hours or exactly what the limit is, but it is approximately half a day's production. Thank you VorlonFCW for your reply. I like what you are saying about you could get 1500 barrels of oil from a 3000 barrel a day oil province, and i will now have to keep a better eye out for this. On a similar sort of reasoning if you are capturing the nations supply depot with 20000 barrels of oil and 35000 metal could we not also get at least 10000 barrels of oil and 17500 metal - is this not a reasonable request? I think that is reasonable, but of course not all the nations reserves will be stored at the capital. The portion of a days production that has not been used still being in the producing province is logical. Along the same line, it would be fun to see sabotage spies steal the resources and credit them to your inventory. We did not just increase the cost of Infrastructure to extract more gold. We increased the cost of Infrastructure because also the benefit from Infrastrucutre was increased by us. They are now giving +5% morale per level, which results in higher resource production as provinces with higher morale also produce more resources. It also makes it easier to maintain captured provinces far away from your capital, as with higher morale the revolt risk is reduced, which leads to less spendings to prevent revolts. So in fact we made it easier for players in some areas and adjusted the costs accordingly to keep it balanced. We also didn't increase prices of other buildings, which you implied with "etc.". As for units we balanced costs according to their strength, e.g. we reduced the anti air cost but increased the airplance upkeep. Our goal is to have a balanced game with alot of different viable strategies, where every resource and every unit matters and has an impact. We are not totally there yet and therefore we will continue to balance the game in 2019. CoW is a good game, but in terms of being just a military strategy and tactics game, whilst the use of gold in game play is an option, CoW is NOT just a military tactics and strategy game. Gold use can be abused and is used to ruin the game for those just wanting to enjoy the game just for military tactics and strategy. I have said it before but will say it again here. Keep gold use to outside game play. There would be no options for the use of gold at all in a Pay-to-play game once the game is started. I for one would pay-to-play depending on costs. The top winners of a pay-to-play game can get a free pay-to-play game, and the others can keep there end game points until they have accumulated enough points to earn a free pay-to-play game. Sorry I have gone off track. 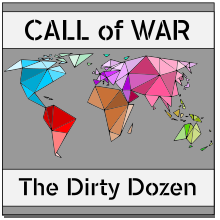 War booty from enemy capital city capture - please give us a share of the resource stockpile for that country if we capture their capital - i believe in most wars there was a desire for war booty capture to offset all the blood and sweat lost, or to capture resources because you were short. The post was edited 11 times, last by BattleIvan ( Jan 3rd 2019, 9:52pm ). Did you ever try to play in the players league?